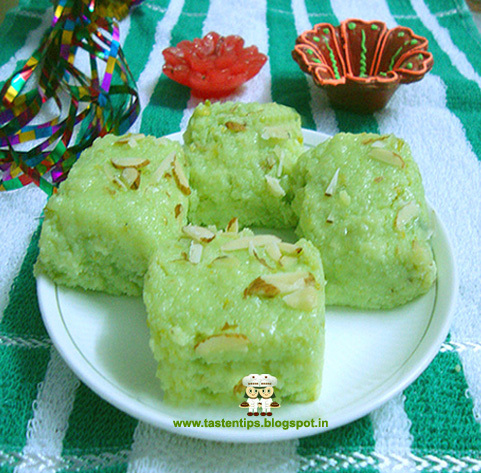 Pista Burfi is a traditional Indian delicacy.The sweetness of sugar and green color of pista, mix with fresh creamy texture of mawa make pista burfi very delicious and tempting. Pista, milk, sugar, cardamom powder and dry fruits are main ingredients used to prepare this mouth watering dessert. 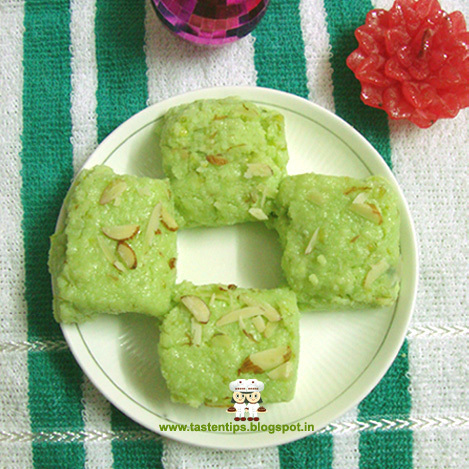 This aromatic and delicious sweet is a perfect choice for this festive occasion. 1. Soak pista (pistachios) in warm water in a bowl for 10-15 mins. 2. Drain, peel pista and blend them into a fine paste. 3. Cook khoya in another pan till it become slightly dry. a sugar syrup of 1 string consistency. 7. Transfer this mix to a greased plate and spread evenly. 8. Garnish burfi mix with chopped almond and let it cool. and friends on this Dussehra. 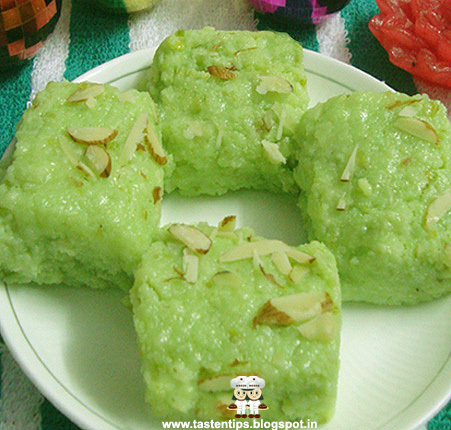 1. khoya will make your burfi more soft and tasty. 3. You can make variation by adding other nuts and fruits. I can imagine the taste, colour look awesome, have you used food colour or it is pista's colour. thanks for visiting my blog.i have used both colour & pista. Wow!! looks super tempting!! lovely color!! I am in love this color. Looks very tempting!